The essential role of redox regulation in health and disease is undisputed. Redox reactions – electron transfer reactions – are required for almost all aspects of a cell´s life. Reactive oxygen species (ROS) have long been considered to be exclusively deleterious by damaging DNA, proteins, and lipids. Meanwhile, ROS were uncovered as important second messengers for specific signaling events via reversible oxidative posttranslational thiol modifications. Adequate reaction velocity and appropriate specificity for regulation of these modifications is mediated by enzymes, especially by oxidoreductases of the thioredoxin family, namely thioredoxins, glutaredoxins, and peroxiredoxins. In our former work we identified members of this protein family as Fe2S2 cluster coordinating enzymes and important roles during iron homeostasis of some of those. We also revealed essential functions of a specific glutaredoxin during vertebrate development of the cardiovascular system and the brain. regulation of collapsin response mediator protein 2 (CRMP2). Our current work is embedded in the research activities of the Department of Neurology (Molecular Neurology / O. Aktas), Heinrich-Heine University Düsseldorf (headed by H.-P. Hartung). We aim at the translation of our former findings into the medical context of neurological deficits, focusing on neuroinflammation, e.g. multiple sclerosis. During neuroinflammation activated microglia, the immune cells of the brain, contribute to cell death of oligodendrocytes, which are the myelinating cells of the central nervous system. 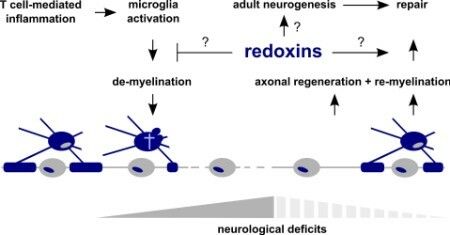 Subsequently, axons lacking protection by myelin sheaths undergo degeneration. We investigate specific thiol redox events in disease progression and repair of damaged brain areas. All publications are listed here.